Oxford is located in 80 km north-west of London, in a strategic place at the confluence of the Thames and Cherwell. This city has approximately 140,000 inhabitants and is known worldwide for its prestigious university. The architecture of the university buildings of Oxford is one of the most mide-blowing of Britain. Literary references are legendary in Oxford: CS Lewis, JRR Tolkien and Oscar Wilde and others had live here. It is here that the author Lewis Carroll met Alice Liddell, who inspired Alice's Adventures in Wonderland and Through the Looking-Glass. Moreover, some sites in Oxford have inspired some site in the famous movie Harry Potter. For example, the great hall of the imposing Christ Church College of Oxford University has been a source of inspiration for the Great Hall of Hogwarts and the Bodleian Library, New College and Blenheim Palace are all also served as filming locations for movies. During the night, there is a lot of thing to do in Oxford: bars, nightclubs and concert halls are opened the night. For people who like the live music, you can enjoy in the O2 Academy, located in Cowley Road. In the city-center, you can find some of the most popular bars on George Street and Magdalen Street. If you are looking for a more eccentric experience, you can explore the Bohemian neighborhood of Jericho. Oxford is the right place to do shopping. You can find in the whole city large traditionnal retailers. Moreover, in the city-center, you can find the Covered Market that offers you a lot of stand where everything can be sell such as handmade gifts, Oxofrd sausages and old books. For people who loves brands, throughout the year, the fabulous Bicester Village offers discount up 60% of the collections of more than 130 shops, including for example Alexander McQueen, Burberry and Mulberry. As the city of Oxford includes the oldest university in the English speaking world, you can visit one of its 38 colleges and follow the traces of political leaders, saints and Nobel laureates. Another thing to see in Oxford is thr Oxford Castle where there were prisoners in the 900-year-old crypt which served as prison from 1071 to 1996. The Ashmolean Museum, founded in 1683, was the first public museum in the world. Today, it is one of the largest art and archeology museums in Britain and you cannot not visit it. 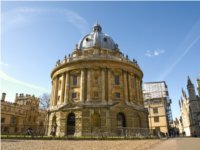 As Oxford is marked by literary references, you cannot miss the The Bodleian Library, the Radcliffe Camera and Sheldonian Theatre, designed by the architect Sir Christopher Wren. And do not miss Kelmscott Manor, the residence of the poet and craftsman William Morris, and the magnificent Blenheim Palace, considered as one of the finest baroque houses across the country. Do not miss the literary festivals, jazz and chamber music at Oxford. As Oxford is famous, you can enjoy a meal at the Old Parsonage Hotel, where Oscar Wilde would have stayed or enjoy a pint at the pub Eagle & Child, where met regularly JRR Tolkien and his literary circle, the Inklings. if you want a fine dining, you can visit the nearby village of Great Milton, where the Le Manoir aux Quat'Saisons is located, a distinguished 2-star Michelin restaurant owned by famous French chef Raymond Blanc. In Oxfor, you can use buses, rail and taxis. Rent a car is possible too.